A complete and current listing of available rooms can be accessed using the "Book Now" button below. Payment in full will be required to complete the reservation process. We take most Major Credit Cards. No Personal Checks are accepted. A Confirmation of Reservation will follow booking completion and payments accepted. An additional Barefoot Mailman Confirmation of Reservation will follow by email with a Reservation ID Number for your records. Please refer to this number when contacting us regarding this reservation. We reserve the right to refuse, cancel (with a full refund of payment) any request or do a background check on guests. Our goal is to make your visit as safe and pleasant as possible. The button below, you will open a new tab or window to our booking partners website called "Free to Book." From there you will be able to complete your reservation. We require an email to cancel a confirmed reservation. You may cancel any reservation and receive a full refund of payment (less a $25.00 processing fee)anytime prior to 24 hours before Check In at 2:00pm on your first date of stay. Late (within 24 hours of Check In) Cancellations or No Shows will incur a penalty amount equal to the price of one night in that room before any refund is issued. By making a reservation and providing your credit card information you acknowledge your acceptance of our reservation and cancellation policy and agree to the cancellation fee or penalty. Check In time is 2:00pm unless an earlier time is agreed upon. Legal age for Check In is 21 years of age. A valid picture ID is Mandatory at Check In. No one under 21 permitted without a Parent/Guardian. All registering guests and adults 21 years of age or older will be required to furnish an ID at Check In. General Information can be obtained by calling (561) 585-0600 between the hours of 9:00am and 1:00pm EST daily. No reservations are taken over the telephone. 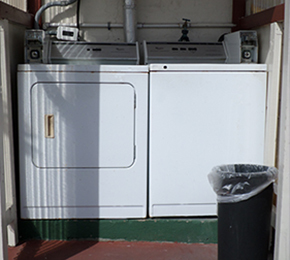 We offer a Coin-Operated Washer and Dryer for our guest's use. The Washer costs $1.50 per load and the Dryer gives 45 minutes of drying time for $1.75 per load The washer uses cold water and we have change. One FREE detergent available. As a service to our Checked-In Registered Guests, we can provide a party setting from 2 to 10 people if requested at least 24 hours in advance. We supply covered seating, plastic utensils, cups and plates, FREE ice and coffee if requested. Motel Rules must be followed. No excessive noise after 10pm and No Noise after 11:00pm as a courtesy to our other guests. $60.00 – Single Traveler Room– ALL TAXES INCLUDED - Located in our Courtyard Setting and designed in the style of the European Youth Hostel, these rooms are perfect for the Budget-Minded Tourist. Recommended for one or maybe two adults. Compact, yet tastefully designed to include features like Flat Screen TV with Cable, Writing Desk, Tiled Floors, Deluxe Double Bed, Ample Closet Space and a Private Bathroom with Hot Water Showers and wall-mounted hair dryers. A Microwave, refrigerator, FREE Ice & Wi Fi! These rooms are equipped with a whisper quiet HVAC ductless Air Conditioning unit and Heat Pump too! $70.00 – Family Traveler Room– ALL TAXES INCLUDED - Located in our Garden Setting, this is a large bedroom designed for a couple and maybe a child. This room includes features like Ceiling fan, Flat Screen TV with Cable, Writing Desk, Small Fridge and Microwave, Tiled Floors, one King-Size Bed, Closet & Dresser Space and a Private Bathroom with Hot Water Showers and wall-mounted hair dryers. 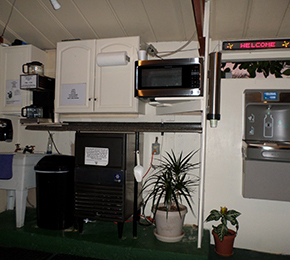 These rooms share a covered patio with a Microwave, a coffee maker (we supply the coffee), filtered hot and cold water and FREE ice too. FREE Wi Fi on the patio and in your room. These rooms are equipped with a whisper quiet HVAC ductless Air Conditioning unit and Heat Pump too! $70.00 – Family Efficiency Room– ALL TAXES INCLUDED - Located in our Courtyard Setting, this is a large bedroom designed for a couple and maybe a child. This room includes features like a Flat Screen TV with Cable, Writing Desk, Tiled Floors, Deluxe King-Size Bed, Ample Closet Space and a Private Bathroom with Hot Water Showers and wall-mounted hair dryers. Each room has a Kitchen Sink, Refrigerator, Microwave Oven, FREE Ice and Wi Fi. These rooms are equipped with a whisper quiet HVAC ductless Air Conditioning unit and Heat Pump too! $75.00 – Deluxe Family Efficiency Room– ALL TAXES INCLUDED - Located in our Courtyard Setting, this is an extra-large bedroom designed for a couple and maybe a child. This room includes features like Flat Screen TV with Cable, Writing Desk, Tiled Floors, Deluxe King-Size Bed, Ample Closet Space and a Private Bathroom with Hot Water Showers and wall-mounted hair dryers. A full size Refrigerator, Kitchen Sink, Microwave with FREE Ice and WiFi! This room is equipped with a whisper quiet HVAC ductless Air Conditioning unit and Heat Pump too! $85.00 – Deluxe 2-Queen Family Efficiency Room– ALL TAXES INCLUDED - Located in our Courtyard Setting, this is an extra-large bedroom designed for up to two couples or possibly a child or two. This room includes features like Flat Screen TV with Cable, Writing Desk, Tiled Floors, Two Deluxe Queen-Size Beds, Ample Closet and Dresser Space and a Private Bathroom with Hot Water Showers and wall-mounted hair dryers. A Refrigerator, Kitchen Sink, Microwave Oven with FREE Ice and WiFi! These rooms are equipped with a whisper quiet HVAC ductless Air Conditioning unit and Heat Pump too! Please note: All prices listed above are Full Price and became effective: October 1, 2015. That means that all Taxes and Fees are included in the quoted prices. All rooms are No Smoking and No Pets Permitted. To book a room for your next visit, use the "Book Now" link to our room offerings at the left side of the page. The best prices are automatically displayed when you "Book Now".